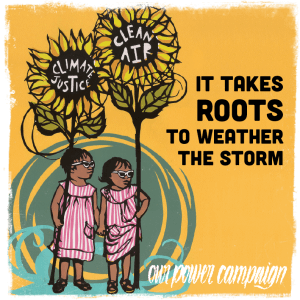 Our Power Campaign is “part of a global struggle for climate justice.” They advocate for the end of energy sources that damage human health and ecosystems, and for practicing climate mitigation and adaptation in tandem. They aim to achieve a transition to zero waste economies with locally sourced food, public transportation, quality affordable housing, clean energy, and ecosystem stewardship. Their goal is to build a national program to create ten million climate jobs within communities that practice collective decision-making and have rights to local resources.